Buying ingredients to suit the household budget is a perennial challenge to all cooks. Growing up in the 1960s, my Dad received his salary fortnightly. Mum served “rissoles” (Aussie for meatballs) according to the budget. Rich man’s rissoles were made with minced steak, poor man’s rissoles with cheap butcher prepared sausage meat. I never cared much for the latter, until one day Mum announced that the poor man had struck it lucky. She pulled from the oven a steaming fragrant dish of “Porcupine Meatballs, ” a new recipe she’d made from a newspaper clipping. Sausage meatballs, bulked up with steamed white rice, simmered in the oven in sweet creamy canned tomato soup made it an instant dinner table favourite. Health awareness in 2013 means I’m discerning about the fat/salt/preservative content of my sausage and I prefer to cook with fresh tomatoes so this is how I prepare my Mum’s “Porcupine Meatballs ” for my grand daughters who love it as much as I did fifty years ago. In the food processor blitz the carrot, celery, garlic and parsley. Add half of the minced pork and process to a smooth paste. Tip the pork paste into a bowl, then knead in the quinoia, the remaining pork mince and fennel seeds. Season well. At this point I’d fry a little very small patty of meat to check the seasonings. Adjust if necessary. Roll the prepared pork into balls about the size of a walnut, 2cm diameter. Toss the meatball in rice flour to lightly coat then set aside. In a wide shallow lidded casserole dish, heat the passata and stock, taste and season with sea salt, freshly ground pepper and a little sugar if the tomatoes are acidic. Add the meatballs in a single layer to the sauce, spooning a little sauce over each as you go. Cover the casserole dish and bake in for 30 minutes. Remove the lid, add the cherry tomato halves and bake uncovered for a further 15 minutes. 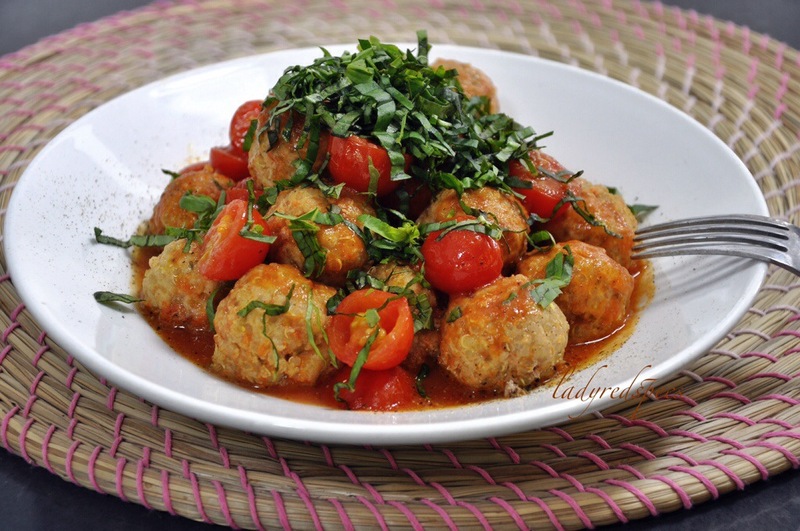 Scatter a generous chiffonade of fresh basil over over the meatballs and serve. Delicious served with rocket (aragula) and Parmesan salad, crusty bread to mop up the sauce, and a decent glass of red wine. Glad you had fun with it!! This looks delicious! Like the use of stock and fresh tomatoes for the sauce. Interesting that you don’t brown the meatballs first. Thanks, it’s a really nice dish. Poaching the meatballs is a trick I learned from a Calabrian friend, the meatballs stay soft and juicy and because there is no caramelization, the tomato flavour of the sauce stays fresh and lively. I think pork meatballs have so much more flavor than those using any other type of meat, as I’m sure these do. Your use of quinoa here, rather than rice, is a nice substitution and I love your use of fresh cherry tomatoes in the sauce. They’ll add a freshness, as well as a bit of texture, to the dish. We would have devoured these as kids. Thanks John, and believe me, the big kids devour them too! I love their name… porcupine meatballs! What child wouldn’t love them? They do look fabulous. And with the addition of quinoa too. Makes them healthy, no? I guess when they have rice included, it’s supposed to stick out like porcupine quills! Ha, yes healthy AND delicious! They look delicious! I’ve been wanting to make (chicken) meatballs cooked in tomato sauce. Your recipe is worth a try! 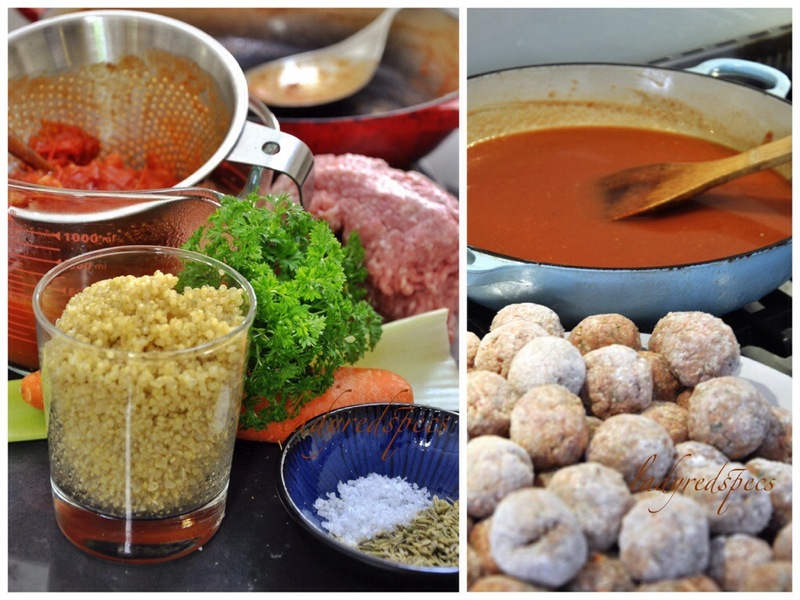 Yummy, I love your idea of adding quinoa to the meatball mixture (though I occasionally add rice in mine)! Must have been delicious! The quinoia worked really well in the meatballs! I am always surprised how good this tastes…. I remember these rice filled meatballs from my own childhood in the 60s in the USA. A blast of nostalgia! Yours look delicious! – a must try. Those are definitely more photogenic than porcupine meatballs. I tried to photo my tried and true porcupine recipe and I thought they were too ugly to post. Putting quinoa in there updates the recipe and make it more photogenic! I didn’t know you made porcupines in Australia…never heard anyone mention them when we were there. And it took me a while to realize what rissoles were lol. Thanks! Unfortunately quirky words like rissole are dying out as our language becomes more global, but they taste good whatever you call them! 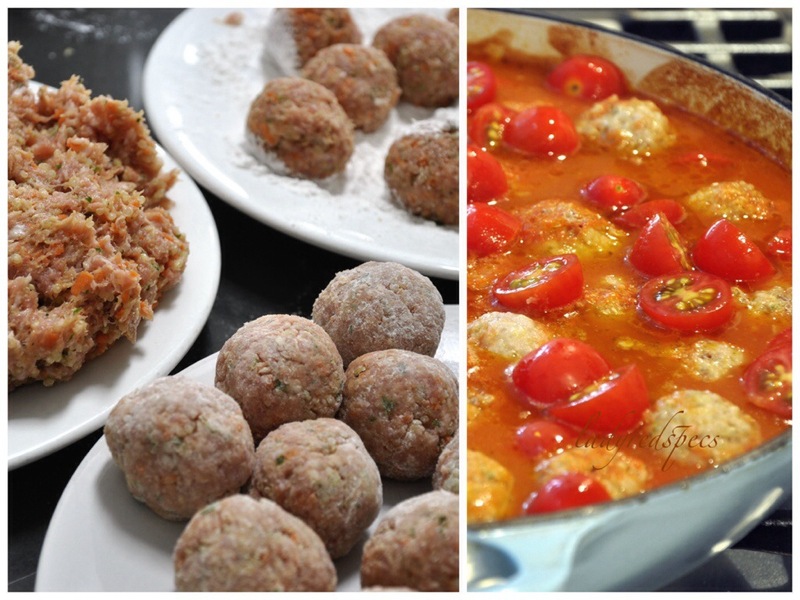 This entry was posted on October 26, 2013 by ladyredspecs in FODMAP diet, Food, Gluten Free, Light Savoury Dishes, Pork and veal and tagged gluten free, meatballs, quinoia, tomato.